G. T. BEAUREGARD. Autograph Letter Signed, to Col. Charles J. Helm in Havana Cuba. From Charleston, S.C., January 28, 1863. On “Head Quarters, Department of South Carolina, Georgia & Florida” stationery. Endorsed on verso by Helm. 1 p., 8 x 9⅞ in. Permit me to thank you, & thro’ you Mrs. Phebe M. Newcomb, for the wollen socks she has been kind enough to make & to send for our gallant soldiers now battling manfully for our rights & our Independence regardless of the snows of Virginia & Tennessee altho’ in many instances shoeless & without blankets! With my kind regards to Mrs. Helm & thanks to Mrs. Newcomb I remain Dear Col.
Col. Chs J. Helm Esqr. Beauregard assumed command of the Department of South Carolina, Georgia, and Florida on September 24, 1862, with headquarters in Charleston. 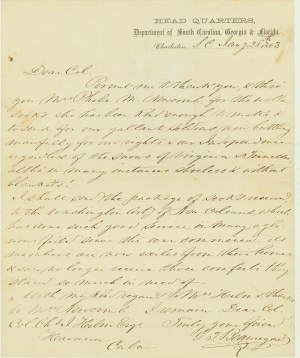 On January 31, 1863, three days after this letter, Commodore D.N. Ingraham executed a successful attack on the Union blockade vessels outside Charleston harbor, as part of Beauregard’s energetic plan to strengthen Charleston’s defenses. The Confederate ironclad rams Palmetto State and Chicora crippled the Quaker City and forced the surrender of Mercedita and Keystone State, running off two other vessels. The fruits of the victory were temporary, but they bought Beauregard more time to improve fortifications before the Union Navy returned in strength in the summer. In large part due to Beauregard’s untiring efforts, the Union attack on Fort Wagner in July 1863, made famous by the participation of the African-Americans of the 54th Massachusetts, failed. Charles J. Helm (1817-1868), a Kentucky native, was U.S. consul general in Cuba until 1861, when he resigned and became a special agent of the Confederacy in the West Indies. Pierre Gustave Toutant Beauregard, an 1838 graduate of West Point, directed the attack on Fort Sumter in 1861, making him a hero in the South. He commanded troops in the Battle of First Manassas, and planned the attack at Shiloh in 1862, the first major battle in the West. He assumed command of the western army after Albert S. Johnston’s death at Shiloh, but was replaced after taking unauthorized sick leave, by Braxton Bragg. In late 1862 and all of 1863, he commanded the Department of South Carolina, Georgia, and Florida. In 1864, he was reassigned to southeastern Virginia, where at the Second Battle of Drewry’s Bluff (Fort Darling), Va., Beauregard defeated Benjamin Butler’s Army of the James, and then kept his enemy pinned down at Bermuda Hundred. Beauregard was essential in defending Petersburg until Robert E. Lee could catch up with Ulysses Grant’s swift movement across the James River. Beauregard reorganized John Bell Hood’s battered Army of Tennessee in the interior of Alabama in the winter of 1864-1865, and hurried with reinforcements to defend the Carolinas against Sherman in March and April, surrendering with Johnston on April 26, 1865. (New York, 1884), pp. 106-108.